This is to certify that Renikunta Sai Nigam S/o shravan Kumar and Harika born on 18th April 2013 from Karimnagar, Telangana, India. 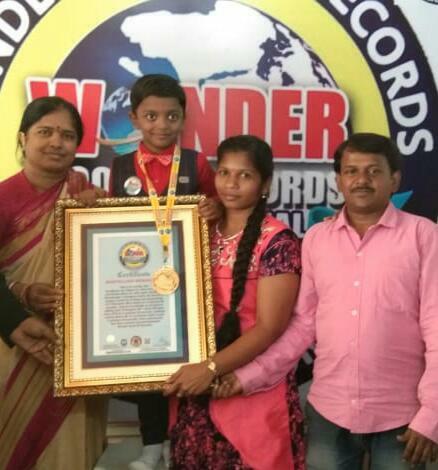 He has set a unique record by reciting and memorizing 119 Telangana MLA names in 3 minutes 48 seconds, general knowledge in all aspects adding upto (Telangana 50 + other GK questions 270) in 6 minutes 32 seconds, multiplication tables till 11 in reverse order in just 3 minutes 30 seconds. This is a wonderful memory. This event has been entered into international wonder book of record.